I prepped a nice deep rich bed for gourds a couple years back and successfully planted it in 2010 and 2011. 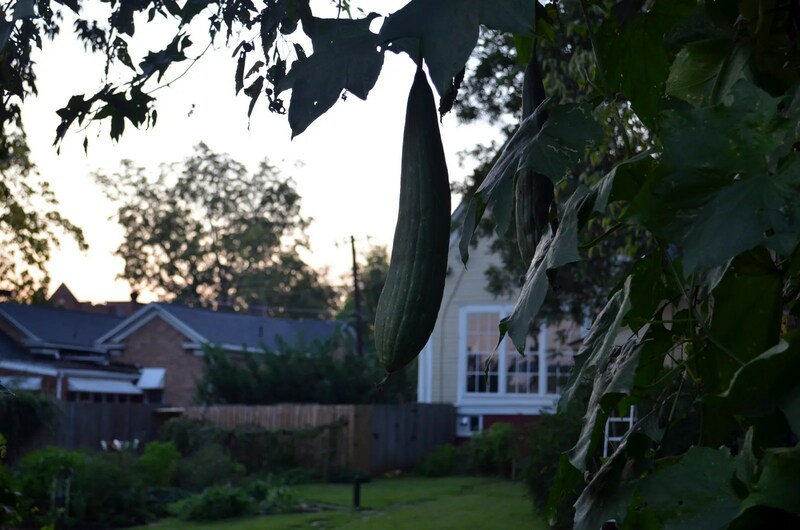 The yield was decent (birdhouse in 2010, luffa in 2011). Volunteer tommy toes hijacked the bed in 2012, so no gourds were planted (besides I still had a surplus of both types). 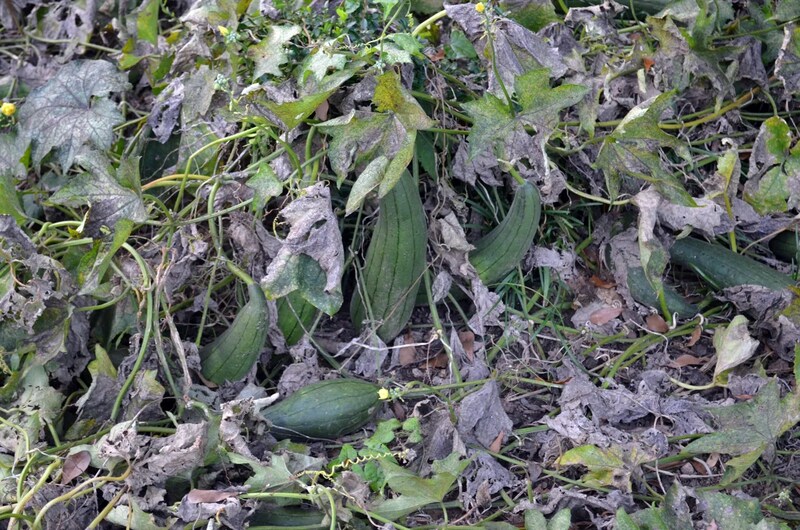 Last winter I spilled luffa seeds in a stack of rocks and couldn’t recover them right away. By the time the rocks were moved and used, most of the seeds had been obscured or covered by leaf litter and mulch. Well, they sprouted. The vines along the ground rooted at every leaf node and became uber-zombie-vines, able to absorb nutrients and water at a significantly higher rate vs being on the fence in previous years. So basically I hatched gourd kudzu, which was ok since it choked out 99% of the weeds that would have sprouted in the area they covered. These vines are finally in decline and I’m getting a glimpse of their production for the first time now. 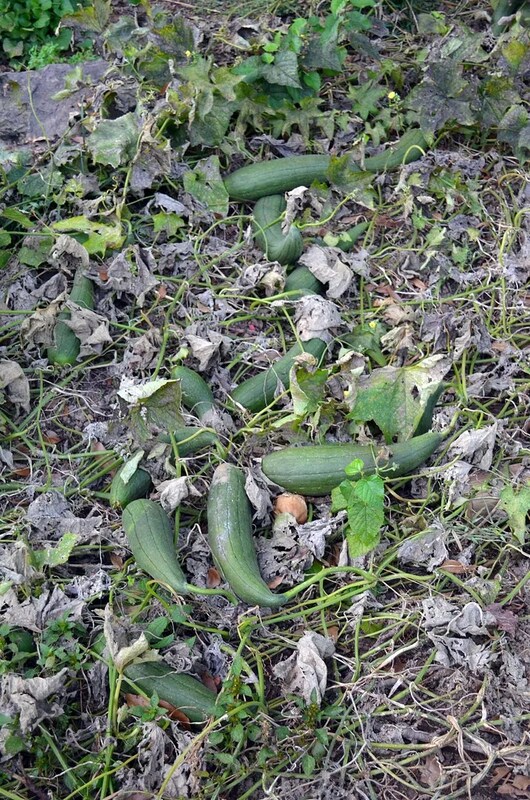 Over the 2nd half of the season, I had harvested smaller gourds when visible (zucchini substitute) but knew more were out of sight/reach below the large leaves. Lesson learned (again): Sometimes all the work we do to prep soil and pamper our plants is a waste or even to the plants’ detriment. As they say, “Nature finds a way”. SO cool! Did you say you used them as a zucchini substitute meaning you ate them? 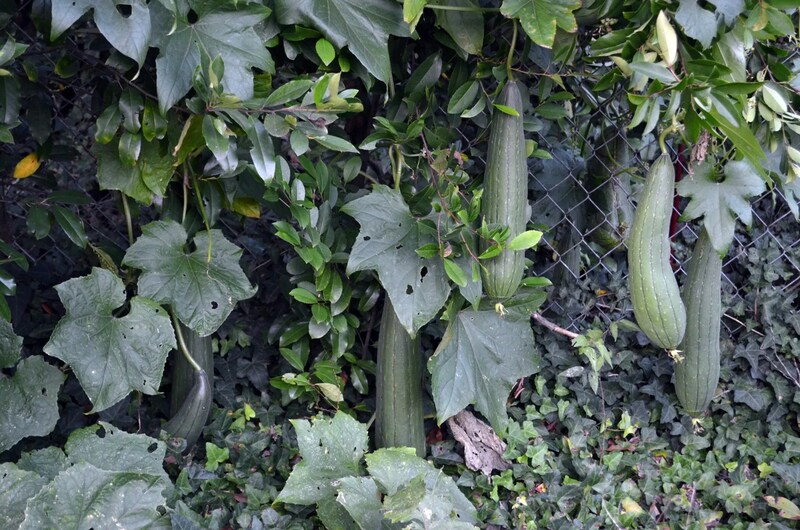 I’ve never grown gourds before & didn’t realize they could be edible. That’s amazing though, to see all those gourds. What will you do with them? Can they be dried and used like some other types of gourds? So interesting! I had some volunteer squash in my compost, but they “cooked” over the summer. Now I am dealing with eleven Pennsylvania Crooked Neck Squash. 15lbs each. I hope you keep this blog going. Your prose and photography are excellent; as well you really seem to enjoy it. Thank you, I plan to keep it going.